Butternut squash curry soup is a spicy vegan recipe to liven up any festive meal, particularly Thanksgiving. This recipe will make 4-6 servings, and takes about 15 minutes to prepare and about 30 minutes to cook. Leftovers can be stored in a covered container in the refrigerator for a few days. 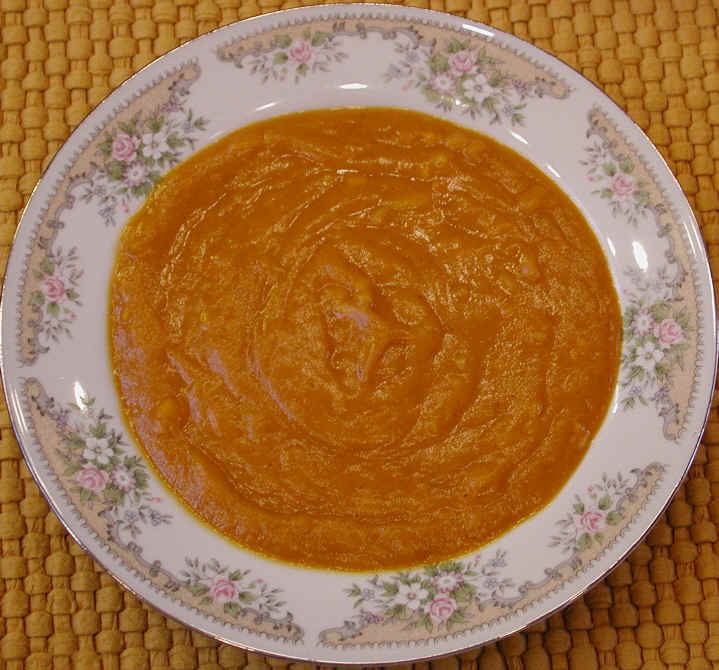 Wash and cook the whole butternut squash in a covered baking dish in a microwave oven on high, or in a conventional oven at 350 degrees F., until the squash is soft. Before cooking, make sure that you poke a slotted hole (as a pressure vent) with a large knife into the seed cavity of the squash. Make sure the knife does not go more than half way through the squash. When cooking, the hole should be on the top or upper side of the squash. It will take about 7 minutes/pound in the microwave oven. If you are using a fresh onion instead of the freeze-dried onions, the washed and peeled onion can be cooked and blended with the squash. Remove the cooked squash from the oven and place the two cups of apple juice in the microwave oven for 4 minutes on high. While the apple juice is warming, split the squash in two from stem to bottom. Be careful; it’s hot. Scoop out the seeds, and set aside for roasting, if you desire. Scoop out the squash flesh from the half-shells and put into the container of a high speed blender along with the warmed apple juice, curry powder, and cinnamon. Blend on high until smooth. Taste it. Not all curries are the same. You may want to add additional seasonings, including the red pepper. If you desire a thinner soup, add some heated water, and blend again. Remove the container from the blender. If you are using freeze-dried onion flakes, stir them in at this time (do not run the blender). Once mixed, the soup is ready to serve and enjoy.